The Preaching Life by Barbara Brown Taylor, Cowley Publications, 1993, 180 pp. 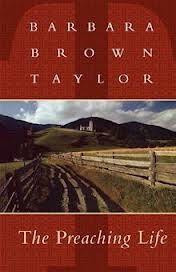 Barbara Brown Taylor’s writings and reflections are always rich and beautiful. The Preaching Life is no exception. The book talks about her own life and relationship with preaching, which is insightful for anyone engaged in preaching or listening to sermons. The book is divide into two sections, “A Life of Faith” and “The Preaching of the Word.” The first is her reflection on her own call into ministry, the role of the church, and the task of preparing sermons. The chapters follow a simple trajectory: A Church in Ruins, Call, Vocation, Imagination, Bible, Worship, and Preaching. The second section includes 13 sermons, mostly on the Gospels. I read the book more for the reflection than the sermons, so I will focus on that in my comments here. Taylor’s sermons are always thought-provoking, as she has a way of drawing us into the intersections between the life-world of the Bible and our own. I especially appreciated her perspective on preparing sermons that attempt to join the timely pastoral concerns of the congregation and the timeless stories of scripture. Sermons reside in the space between pastor, congregation and God, and they always emerge from the preacher’s reflections on the relationships between all three. From the beginning, she speaks about call and vocation as they apply not simply to preachers and clergy, but to all of the baptized—we are all called to live our lives for God through our work and our service. Her approach to preaching echoes that theology throughout. Then I remember that God’s power is not a controlling but a redeeming power—the power to raise the dead, including those who are destroying themselves—and the red blood of belief begins to return to my veins. I have faith. I lose faith. I find faith again, or faith finds me, but throughout it all I am grasped by the possibility that it is all true: I am in good hands; love girds the universe; God will have the last word.